Pogba starred for Les Bleus in Russia as they lifted the famous trophy but he sported different colours on holiday in LA this week, wearing Paulo Dybala’s No21 shirt. The two midfielders became good pals when they played together at Juventus before Pogba left to rejoin Manchester United in 2016. Are you, like Jose Mourinho, still scratching your head? They experienced vastly different World Cups with Dybala making just one appearance as Argentina were dumped out in the round of 16 by eventual champions France. Dybala didn’t even make it off the bench in that game with Pogba, who scored in the final against Croatia, perhaps wanting to help raise his friend’s profile a bit by pulling on a replica shirt. Manchester United and France midfielder Paul Pogba’s agent is expected to tell the Red Devils he can broker a £100m move for the 25-year-old World Cup winner to Barcelona. Who expects him to do that? The source for the BBC’s story is the Daily Star (owner: Reach media). 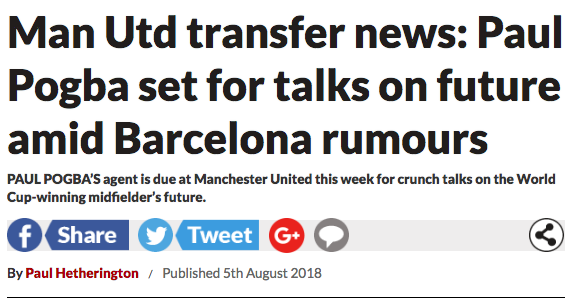 The paper tells of Barcelona “rumours”. What Barcelona rumours? The ones the agent is “expected” to discuss? According to the Sunday Star, Raiola is hoping to broker a £100m deal with the Catalan club to rescue his client’s career. It’s a human catepillar of utter balls.